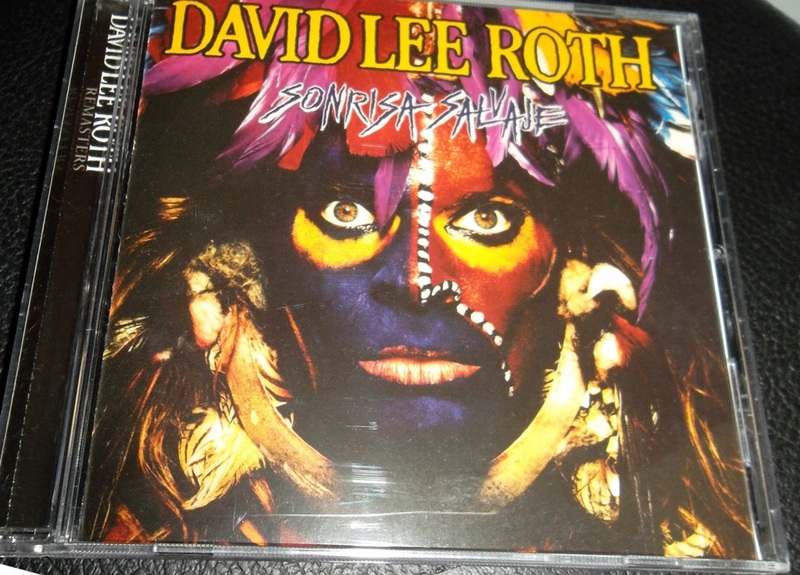 You have to give David Lee Roth credit, he is nothing if not ambitious. Sonrisa Salvaje, near the very beginning of his solo career, represents a lot about DLR that people forget: Contrary to the wild image and outrageous personality, he’s actually quite intelligent and cultured. I guess that’s one reason why he decided to record three sets of vocals for his Eat ‘Em And Smile album back in ’86! (The other reason was that DLR was told there was a huge market for rock music in Mexico.) His Portuguese version has never been released, and the Spanish version was never released on CD, until this Rhino reissue/remaster came out. You should already know these songs (and if you don’t, then I need to go back and review Eat ‘Em And Smile, and you need to buy the English version first). You should already know it’s his all-time best solo album. His ace band — Steve Vai, Billy Sheehan, and Gregg Bissonette — rivaled the mighty VH itself. Together they put together this album which contains some of Dave’s best and most memorable tunage. It was playful, fun, smokin’ and diverse. It had everything from space age rock (“Shy Boy”) to a a Sinatra cover (“That’s Life”). The bed tracks here, the instrumental backings, are all identical on this version (except for a minor edit to “Big Trouble”). The Spanish translations, as expected, are a little awkward. That was bound to happen. “Shy Boy” becomes “Timido” and kind of stumbles off the tongue a bit. “Ladies Night In Buffalo?” becomes “Noche De Ronda En La Ciudad”. You see what I mean? The one song that I actually enjoyed more on this release was “Going Crazy!”, now known as “¡Loco Del Calor!”. That song always had a pseudo-tropical sound to it, so the new lyrics fit right in. The rest are awkward, as the words never seem natural. Interesting tid-bit: As of this writing (September 2012), Eat ‘Em and Smile has not been remastered and reissued in its English version! So, technically, if you wanted to hear remastered versions of these songs, this is the only place to get them. And that, to me, is a weirder thought than a Dave album in Spanish! I love DLR! He seems truly fearless. It’s right up his alley to do something like this, and you know it wasn’t his people that suggested it – it could only have been him. Yeah I think so. I think he speaks a couple different languages anyway. I can imagine that he has a lot to say in whatever language he’s speaking! Friday Music is a great label too… got some of their vinyl, some Cheap Trick and Alice Cooper stuff. Really great sounding reissues. I would like to get Eat ‘Em on vinyl. Great record. I sold my Steve Vai tab book long ago though. I thought, “Who am I fooling?” Hahah. Haha when I said working through it a page at a time I should have said a note at a time! There is some gonzo playing on that album. Phew. I remember the one I had was actually transcribed by Steve himself, and he had symbols for “spin the whammy bar real fast” and all kinds of crazy stuff! Shyboy was credited as Roth/Sheehan when the tune is actually written by Sheehan alone. He used to play that one in Talas, years before he joined DLR and the song is exactly the same. I had no clue he recorded three versions of this, but I’m not surprised. Seems like the typical Dave thing to do. The reason this album showed up in my “top ten posts” this week is because they played the Spanish version of Yankee Rose on the radio yesterday, from my own personal collection! And then they linked to this review. It’s an interesting CD, but now I really should review the original. I have the Talas version of Shy Boy, and also a live Mr. Big version. I smile when I get my vinyl copy of this out because I was away from the UK in Helsinki and I bought this in a music shop there. I didn’t know it existed at the time (summer ’94) and it blew my mind! Great stuff.